Xstampers are amazingly durable- which means that they're very easy to care for. However, they do require some minimal maintenance. To use an Xstamper gently press the handle against the paper. Unlike conventional stamps, a hard strike or rocking motion is not necessary. A light press to the stamping surface will ensure the highest quality impression. Allow a few seconds between stamping for maximum ink flow. The Xstamper’s dyestuff ink is ideal for paper because it spreads into the paper and air-dries quickly. The Xstamper produces less desirable results on surface-treated paper such as photo or parchment, because the coating retards ink absorption. 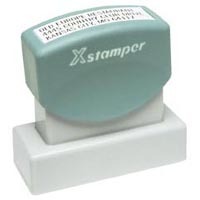 The standard Xstamper in the turquoise and beige mount should not be used on metal, glass or plastic surfaces. We have special stamps and ink for stamping on non-porous surfaces. Custom-made Xstamper stamps should be stored in a dust free environment. The tacky side of any plastic tape can be used to remove dust or paper fibers, which may accumulate on the stamp surface. Plain rubbing alcohol on a dust free cloth can be used on the stamp surface to clean any dirt that may build up. Never rub the stamp surface hard or allow sharp objects to come in contact with the rubber. Re-inking must be performed at such time when the stamp impression has become consistently light. Most Xstampers can be refilled through the back by removing the handle. They were designed this way to keep your hands clean and ink free. Refill only with the original color Xstamper Refill Ink. We have many different models and there are different ways of re-inking. For a complete, illustrated, re-inking instructions please see the package or package insert or click here for re-inking instructions. A selection of ink colors is available 10ml, 20ml, and 60ml sizes..
All brands of ink are not the same. The formulas are different, and another brand's formula may not mix with Xstamper. Also, some inks are not truly ink, but are actually a softening agent as is the case with gel or jelly stamps. These re-activators simply releases ink from within the product. This type of ink will not work at all, and in fact may damage your Xstamper. ClassiX allow you to make thousands of impressions without re-inking! They are an excellent choice for your high volume stamping needs. ClassiX ergonomic construction enables you to hold the stamp any way you want to make great impressions. It has built-in patented re-inking system, which allows you to easily and accurately re-ink the stamp to its original printing quality without removing the inkpad. All ClassiX self-inking stamps feature precision components for a smooth, quiet action and many years of trouble free operation. The ClassiX ink is ideal for paper because it spreads into the paper and air-dries quickly. ClassiX produce less desirable results on surface-treated paper such as photo or parchment, because the coating retards ink absorption. It is not recommended for glass, plastic, metal or fabric. The Heavy Duty Metal Series feature a heavy-duty frame and precision components for a smooth, quiet action and many years of trouble free operation. Deep molded bands provide clean, sharp stamp impressions. Oversized band adjustment wheels prevent your fingers from contacting the bands and make adjustment easy. Re-inking must be performed at such time when the stamp impression has become consistently light. Refill only with the original color ClassiX Refill Ink. Because we have many different models and there are different ways of re-inking. For a complete, illustrated, re-inking instructions please see the package or package insert or click here for re-inking instructions. The inkpad for our hand stamp slides out like a drawer and the holder is removable. Likewise the pads for our Heavy Duty and Light Duty Dater line have removable inkpads. This allows the pad to be re-inked through the top re-inking from the face of the pad, or replaced completely. A selection of ink colors is available in 6cc and 2oz bottles. An advantage to self-inking stamps is you can change the color of the stamp by simply replacing the inkpad with a different color. We recommend you not mix colors of ink. Different formulations of ink for different colors may cause impressions to be blurry if ink colors are mixed. All brands of ink are not the same. The formulas are different, and another brand's formula may not mix with ClassiX.